The sides of the lip are bent backwards so that the lip is keeled and appears very narrow in face view. The main leaves arise from near the base of the plant and are erect and sword-shaped. 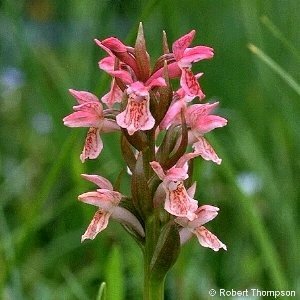 The flowers are carried in a dense spike of 20~30 flowers which in the "typical" subspecies of the plant are flesh-coloured (hence the name 'incarnata'). The subspecies (subsp. incarnata) is probably not, however, the commonest in Northern Ireland. 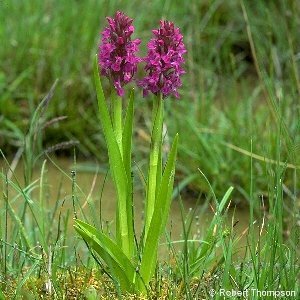 The plant is found in wet ground, usually where the soil water is alkaline or at least not very acidic. 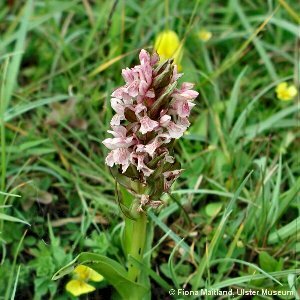 All names: Dactylorhiza incarnata (L.) Soo; Dactylorchis incarnata (L.) Vermeulen; Orchis incarnata L.; Orchis latifolia auct.